Twice Baked Potatoes are the Greatest. "My daughter gave me this recipe because she knows I love potatoes," relates Betty Miars of Anna, Ohio. 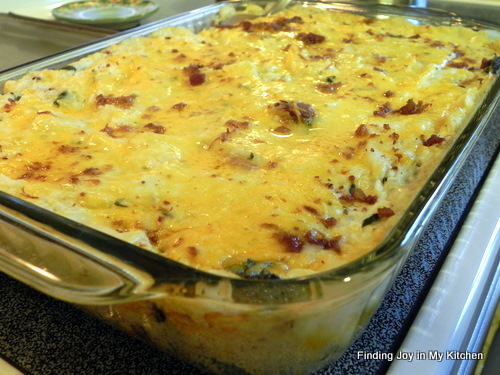 The hearty casserole is loaded with a palate-pleasing combination of bacon, cheeses, green onions and sour cream. Cut baked potatoes into 1-in. cubes. Place half in a greased 13-in. x 9-in. x 2-in. baking dish. Sprinkle with half of the salt, pepper and bacon. Top with half of the sour cream and cheeses. Bake, uncovered, at 350° for 20 minutes or until cheese is melted. Sprinkle with onions.